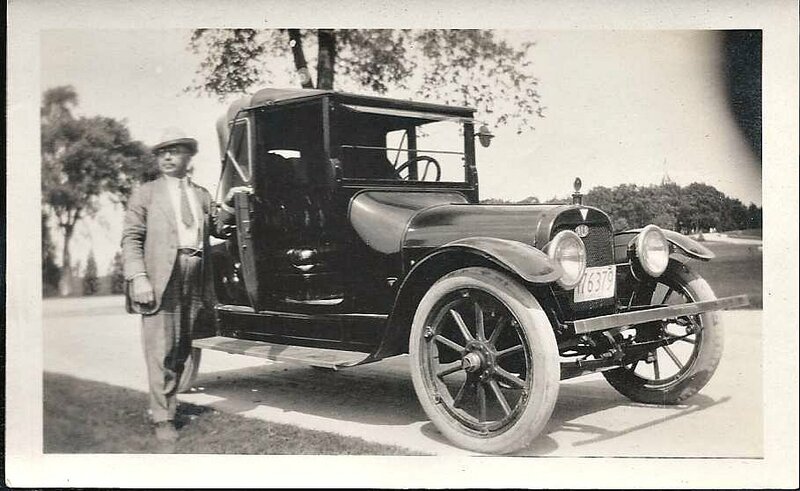 Candid photograph of a man identified on the reverse as Stephen Drew Bartlett of Boston, Massachusetts, with a vehicle he no doubt considered his pride and joy. I believe the automobile to be a 1914 Hudson Model 6-40 Roadster, based on a similar photograph of Mr. Bartlett's wife. She was standing with what appears to be the same automobile and license plate, featured in another post, which drew a reader's identification. Stephen Drew Bartlett was born 9 September 1866 at Plymouth, Massachusetts, son of Hosea Comisa Bartlett and Sarah Frances (Drew) Bartlett, who were born at Plymouth, Massachusetts, and Plymouth or Kingston, Massachusetts, respectively. Stephen was granted membership in the Massachusetts chapter of the Sons of the American Revolution, based on Thomas Faunce, who was the grandfather of Stephen's maternal grandmother. On 5 June 1898, Stephen married Jessie Cummings, daughter of Rev. James Irving Cummings and wife Mary A. "Marianne" Houghton (Fairbanks) Cummings. Marianne was the daughter of Rev. Jonathan Fairbanks. Jessie (Cummings) Bartlett was born 20 April 1862 at Auburn, Maine. Stephen and Jesse (Cummings) Bartlett had at least one child that I know of, Constance, who, sadly, died at about the age of six. The couple lived at Boston until some point between the 1920 and 1930 Censuses, at which time they had moved across the Charles River to Cambridge, Massachusetts. It appears from the Censuses that Stephen spent his whole life in the jewelry business. 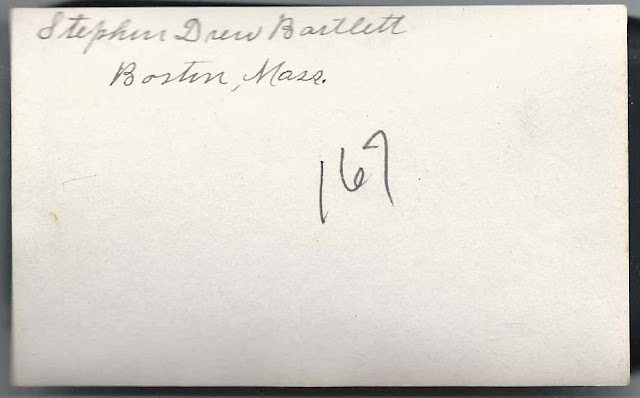 He spent at least part, if not all, of his career with F. G. Butler & Co., Inc, at 406 Washington Street, Boston, where he's listed as Secretary of the corporation in a directory from about 1911. If you have corrections and/or additions to the information above or if you can identify the make and model of the automobile, please leave a comment or contact me directly. Thanks!